A dental implant is a permanent replacement for a missing tooth. You can have one implant or an entire set. The implant is a small titanium post that substitutes as your tooth root. A prosthetic tooth is placed on top of it, giving you a very secure replacement. You can do anything with dental implants that you would do with your own natural teeth. They look completely natural as well-- no one will be able to tell that your teeth are not real. The first part of the dental implant procedure is to have the root form— a small titanium screw— surgically placed into the jawbone. This part is done by an oral surgeon. We have two surgeons we work closely with. There is a healing time that will be necessary after the surgery. During this time, the bone needs to grow around the post in order to give it the same support structure your natural tooth root would have. This process is called osseointegration. Once the healing process is completed, a crown is placed on top of the new root. This serves as your new tooth. 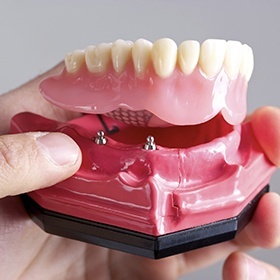 You'll be able to do anything with your new implant that you could do with your own teeth. An implant-retained crown is made up of three distinct parts: the implant itself, a custom-made all-porcelain crown, and an abutment. The abutment, which is like a tiny screw, is what attaches the crown firmly to the strong base that is the implant. Once this is done, it will be virtually indistinguishable from your other teeth. An implant crown can even be attached to multiple prosthetic teeth to literally “bridge” the gap left by multiple missing ones. Dentures are expected to always slip and slide around in your mouth, right? Wrong! 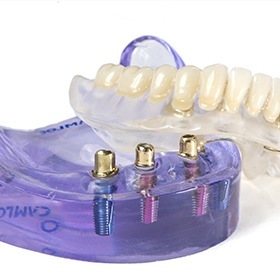 With implant-retained dentures, we can finally give you a set of teeth you can always rely on. A custom-made prosthetic will snap onto multiple implants placed within the jaw to give you a hold a removable prosthetic simply can’t match. Even better, this hold will last for a very long time, and you’ll even have a stronger bite, enabling you to enjoy all of your favorite foods with ease. When there are multiple missing teeth, there are more advantages to getting dental implants. You won't have to worry about dentures falling out at embarrassing times. Plus, you can eat whatever you want without food getting under your dentures. Probably the strongest advantage of having dental implants is that you don't risk having your jawbone being re-absorbed into your body, a natural process that happens whenever you have missing teeth. If you are interested in learning if you're a good candidate for dental implants, you can call our office to schedule an appointment, or you can click here to request an appointment online.